Bhubaneswar: Continuing the drive under Swachhta Pakhwada for Swacch, Swasth aur Shrestha Bharat, the Aluminium major National Aluminium Company Limited (NALCO) today organised a mega cleanliness drive along the stretch of road connecting NALCO Square and NALCO Nagar, at Bhubaneswar. 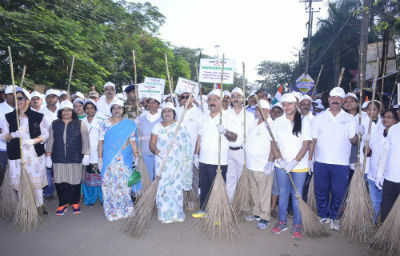 Led by the Chairman of the company, Dr. Tapan Kumar Chand, many distinguished personalities from different walks of life including educationist, eminent media persons, writers, artistes, singers, sportspersons and social activists picked up brooms and shovels to actively participate in the cleanliness drive. The campaign was part of ‘Shramdaan for Swachhta’ to create awareness among the masses and maintain hygiene in and around areas in NALCO residential colonies and nearby Hospitals. Besides, as part of beautification, a stretch of unclean boundary wall was painted depicting ‘Paika Bidroha’ and a garden at vending zone was created. A dance on the theme written, sung and directed by Ms Sabita Patnaik was presented by the girl students of Vivekananda School. Ms. Mousumi Sahu was the choreographer. 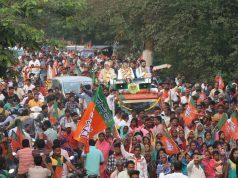 On the spot slogan completion was also conducted. On the occasion, NALCO CMD, Dr. Chand announced company’s plan to promote the culture of hand washing to ensure personal and environmental hygiene, keeping in view that more than 25% population in India and Southeast Asia suffers from communicable disease linked to poor hygiene and sanitation. “We strongly believe that what the community does itself is more sustainable and our main objective is to promote positive behaviour change within the community. For this we focus on four ‘P’s – Prerana (motivation), Protsahan (Encouragement), Puraskar (Accolade) and Prashikshan (training), said Dr. Chand. “Together we look forward for a New India, which is clean & healthy, and this would be our true tribute to Mahatma Gandhi, when we celebrate his 150th Birth Anniversary in 2019”, he added. Directors of NALCO, President, NALCO Mahila Samiti Smt. 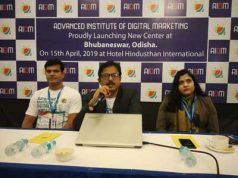 Preeti Roy, employees, students from various institutions and senior officials of NALCO also participated in the event. Dr. Chand also announced about ‘NALCO Gulgul Kunmun award’ to encourage schools/school children for their involvement in maintaining cleanliness & hygiene in toilets constructed under swachh vidyalaya abhiyan by NALCO. 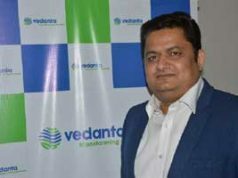 It may be noted that the company as an active partner of Govt of India in implementing the Swachh Bharat and Swachh Vidyalaya Abhiyan has constructed 473 toilets in 224 schools of Odisha and Andhra Pradesh, out of which 172 toilets have been constructed in 85 schools of Koraput district. Similarly, NALCO units & offices also organised various programmes including a Rahagiri at NALCO Township at Angul to mark the Swachhata Pakwada celebration.